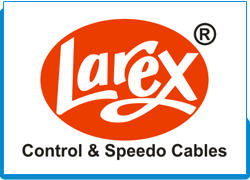 Larex brand is undoubtedly one of the most respected and trustworthy brand amongst automotive control cable manufacturer. The brand was launched in 1989 and since then holds the position of leader in replacement market. Larex products are available all over india at more then thousand counters. These comprise a mix of exclusive larex shoppe, authorised dealers, service & spare parts outlets and dealer-appointed outlets throughout the country.